These were the words of Prime Minister, Voreqe Bainimarama during the COP 23 side event on Risk Informing Development in Bonn, Germany yesterday. 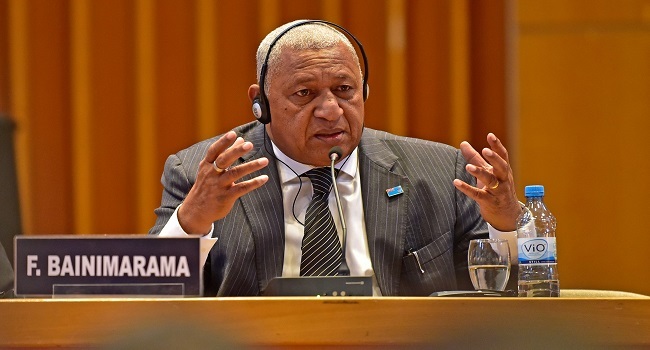 Bainimarama highlighted the events of Cyclone Winston last year and how it has sharpened his determination to make Fiji more climate resilient. He says he will do whatever he can in forums of the world to highlight the plight of the climate vulnerables. He also highlighted some of the initiatives the Fijian Government has undertaken in partnership with UNDP, the Australian Government, an international NGO and private sector agencies. Bainimarama says with UNDP’s Pacific Risk resilience programme, they are bringing local communities into the national planning process and insist that any new development or capital project must be take into account climate risk before given the go ahead. He also says the government has integrated risk into the budget process with special measures for vulnerable groups. Bainimarama also says they have approved the framework for a national adaptation plan.